Need to back up virtual machines, databases and email servers on-premises or offsite? 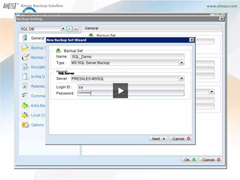 AhsayOBM (Ahsay™ Online Backup Manager) is the client-side backup application that you need! AhsayOBM is a versatile backup application that backs up databases, applications and virtual machines to local and offsite destinations, e.g. local hard disk, on-premises backup appliance, and backup server located in datacenter. AhsayOBM comes with dedicated backup modules for VMware, Hyper-V, Microsoft Exchange Database Availability Group (DAG), Microsoft Exchange Database, Microsoft Exchange Mailbox, Microsoft SQL Server, Oracle Database, Lotus Domino/Notes, MySQL, and Windows Bare Metal. Most customers demand their backups to be completed as quickly as possible. AhsayOBM is one of the fastest backup applications equipped with all speed optimizing technologies, including multi-threading, In-File Delta, fast indexing, small files optimization, unwanted file exclusion filter, etc. Thus, it can definitely fulfill the needs of all speed hungry customers. No customers want to experience trouble during restore. With AhsayOBM, your backup data are 100% restorable, as the corresponding AhsayOBSbackup server will have regular CRC integrity checking mechanism that ensures the restorability. AhsayOBM is totally rebrandable. All the graphics and wordings are customizable. You can even decide to hide some of the features that you don’t want your customers to use. With such capability, AhsayOBM can be fully integrated into a provider’s existing offering mix. With all the above benefits included, AhsayOBM is still the lowest priced comprehensive on-premises and offsite backup application. For example, the license cost is only $75 per CAL if you buy 10 CALs of AhsayOBM. The more you purchase, the more you save. Moreover, upon any purchase of AhsayOBM licenses, we will provide you with the AhsayOBS centralized management console for FREE, so that you can use it to manage all AhsayOBM accounts centrally. Among all backup software available in the market, AhsayOBM comes with the most comprehensive features for virtual machine and physical server backup that you can think of. Ahsay™ Backup Software uses disk-to-disk-to-disk (D2D2D) design which proved to be the best backup system design for nowadays computer systems. See the following diagram for how AhsayOBM fits into the whole architecture of Ahsay™ Backup Software. Simply install AhsayOBM client backup application on the client side virtual and physical servers that need to be backed up. After proper configuration of the backup set, data will be backed up automatically from AhsayOBM to the backup server through the Local Area Network (LAN) or the Internet. Check out the following pricing and you’ll find that AhsayOBM is the best value for money product in the market. You can also choose to own the software license perpetually through the Purchase Model or pay the license as you go through the Meter Model. For price calculation and purchase, simply visit Ahsay™ Shopping Centre and select the quantities you required. Under this model, you’ll own the AhsayOBM software license perpetually after purchase. You are able to continue enjoying our professional technical services and upgrade the software to the latest version by paying an annual software maintenance and upgrade fee which is Free during the first year after purchase. If you are a reseller, you are advised to purchase at least 10 licenses because the unit rate for 10 licenses is a lot cheaper than that for 1 license. If you require only 1 license for the time being, you can buy 10 licenses now, resell this 1 license required to this customer and put the remaining 9 licenses on stock for future use for other customers. Purchasing licenses in lots of 10 saves you lots of money in long run. With a valid maintenance, you are entitled to enjoy our Standard Support service and unlimited Software Upgrade. Maintenance is free for the first 12 months after purchase. For the subsquent years, up to 50% Early Bird Discount on maintenance renewal is available. Click here for the details. The above pricing is for using AhsayOBM with Ahsay™’s brand. If you need to rebrand it, you just need to purchase a Rebranding Option at US$500. It is a One Off payment for unlimited rebranding. After purchasing this option, we will provide you with the credential to access our Customization Portal where you are able to build your branded software installers of AhsayOBM, AhsayACB, AhsayOBS and AhsayRPS with your own graphics and customize the wordings in the user interface. You can choose to hide some of the features that you don’t want your users to use with your version of software. To keep using this Rebranding Option, you just need to keep your maintenance valid. Buy this Rebranding Option through Ahsay™ Shopping Centre. Got questions about AhsayOBM’s rebranding option, click here to view the FAQs first. As a token of appreciation to the contribution of education and non-profit organizations (including charities, NGO’s, religious groups and churches), we are now offering up to 25% extra discount to these organizations. To get more details, please contact us. Being a loyal Ahsay™’s customer through continuous partnership, you are entitled to enjoy further discounts through our Loyalty Program. Click here for the detials. To find out how Ahsay™ outperforms other products, download the following detailed comparisons. I am a new Ahsay™ client and have just purchased your software to be used as a remote backup solution for our existing clients as well as new ones. Your sales team have been very helpful and efficient. We strive to provide the best quality solutions to our clients and in order to achieve this it is important that we get good service from our suppliers. I have been dealing with Galvani and he is knowledgeable and friendly. I look forward to building a good relationship with Ahsay™ . It has been a pleasure dealing with you so far! „I have very good things to say about your support. I send you a lot of question, and always get an answer, sometimes just hours after I send, sometimes 1 day. The good thing is that you have a lot of good Documentation, and very good answers to questions. „We were looking for an answer to all of our tape issues with many of our clients. As a value added reseller of hardware and software solutions combined with managed services we were looking for a way to improve our client satisfaction with back-ups and their availability when required. Many of our clients were storing tapes offsite and hoping no problems would arise. At least 40% of the restores we tried to do from tape either failed or were missing key files to complete the restore process. We decided to look at online\ disk based solutions and found most of those to be either way too expensive or much too complex and needy as far as system requirements, and general use went. When we found Ahsay™ we were a bit skeptical but decided to try the trial anyway. We were surprised and amazed at how simple, stable, and easy to use the software actually was! The included agents work very well and the support from the Ahsay™ team was fantastic! The daily email reports make our clients feel comfortable with the system, so much so that more than half of our back-up clients have stopped using their tape back-ups and are running our back-up solution exclusively. „After 3 unsuccesfull experiences with unreliable or unflexible backup solutions using tape and harddisk, I decided to start working online. At the same time this solution provided remedy for several other issues I wanted to avoid: 1. the risk of someone forgetting to replace tapes, or expensive tape exchange robots to get stuck. 2. To avoid the risks of onsite backup such as fire, burglary, flooding, lightning strikes, … 3. To have a good notification solution for all situations, 4. 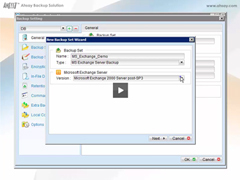 To have a single backup solution for all our platforms, such as file, exchange, SQL, SBS2003. and 5. To have easy access to a history of files (versioning). Somewhat to my surprise Ahsay™ provided a solution to all of these challenges! Many years ago, just before I became an Ahsay™ customer, I was somewhat worried about the future of Ahsay™ : I didn’t know the company, and it was located on the other end of the world. So I took a chance, the investment was relatively small, and payback (as opposed to service providers) would be quickly obtained. Today, I can definately confirm that this decission was one of our better IT decissions. Ahsay™ has the best support department I have ever met in my 20 years of IT experience. Create a ticket and watch your inbox, that’s how fast they are. Although our independent backup solution was good for our company (because we have a lot of experience), I fully realize that backup providers are very good for those who have less in-house IT experience. In fact several of our IT partners have now adopted Ahsay™ backup solutions as part of their services portfolio. I am excited about the most recent introduction of exchange brick level support and volume shadow copy support, which renders the system virtually hassle-free. 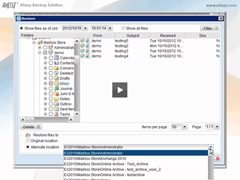 Daily backup reports show successfull results, every day. „Peak Backup was initially deployed to better support backup services of our parent company, Core Tech Firm. In the past ten years, we have deployed high-end, hundred thousand dollar ($U.S.) systems, using corporate software platforms. There became an apparent challenge in the past few years where reliable and scalable backup solutions were cost prohibitive to us and our small to mid-size customers. In 2004 we spent half a year trialing these products: NxxBackup, Lxxxto, NxxxStor, Rexxxx Baxxxp Syxxxms, open source PERL with rsync products, and Syxxxtec. The overall issue was that no one product could support our advertised slogan of „Our ideology is to provide our customers with excellent IT services so their business may grow.“ With any single solution listed above, there is some type of limitation in either cost or scalability. In June of 2004, we installed the Ahsay™ product on our Linux server for trial testing. After a few months verifying positive results, we purchased our first OEM license in November of 2004 and have spent thousands in 2006 alone. With money for service, any company should expect great service from Ahsay™ ; however, we felt compelled to give our testimonial for the product because the product and service far exceed any claim. Ahsay™ help is highly focused on customer support. Ahsay™ is available through their helpdesk ticketing system or phone. Continued development in the form of near-monthly releases. This does not reflect a product that contains bugs; rather, it is a product focus of stability and richer features. 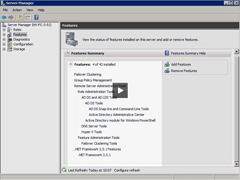 Multiple operating system support for server or client. From a business model, using different solutions for a single customer with different operating systems is too cumbersome. 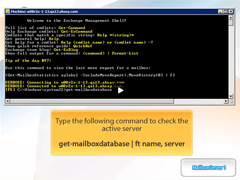 A specific example is replicating from a customer Debian Linux to our Advanced 2003 Server. In-File Delta. Since the release of the in-file delta feature, our bandwidth has dramatically decreased even with an increased number of customers. 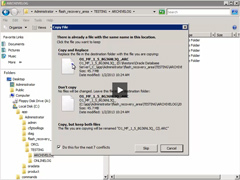 The ability to use one login (one license) to backup multiple computers. One of our customers has fifteen computers with no network share. The result is that we run the Ahsay™ client on all computers using the „run on this computer“ feature; thus, we have utilized only one CAL (client access license) for an entire business. „We run a danish online backup service aimed at the danish SMB market. We have evaluated online backup software from the leading vendors in the market and found that AhsayOBS is the best fit for us. The support we get from Ahsay™ is swift and competent although we are in different timezones. „Offering the best Online Backup possible is our goal. Our choice for Ahsay™ AhsayOBM software therefore is a logic decision. State of the art software, new features added every quarter. It makes it possible for us to service the total SME market up to 500GB per account. Maybe even more important is our good relationship with Ahsay™ . Backup Connect has been tested as best Online Backup provider for 4 timers. „I was working with a company who’s aim it was to provide managed business IP Telephone and e-mail Systems. 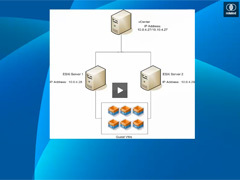 One of our aims was to provide a full offsite backup service as part of this package. After some investigation of Open Source alternatives and other commercial systems I came across AhsayOBS. After testing an installation of AhsayOBS I was very impressed.So impressed in fact that I decided to set-up an entirely new business just to sell online backup services using the AhsayOBS/AhsayOBM software. We have now been operating for a couple of months and as well as providing an offsite service using our own servers we are now using the Replication Services to mirror the customer data to a dedicated replication server. More opportunities have presented themselves as we have become more experienced in using the software. We have identified several customer who would be very interested in their own AhsayOBS servers which would be replicated to our AhsayRPS server to provide fast onsite backups with full offsite replication. We are even discussing this with a number of companies who specialise in Disaster Recovery.